Don’t bother looking in the diaries for this double bill show as it only existed in the world of two people. Due to the close proximity of the Kitchen Garden Café and the Hare and Hounds, it was always on the cards that the venues would be combined one evening and the opportunity finally presented itself. 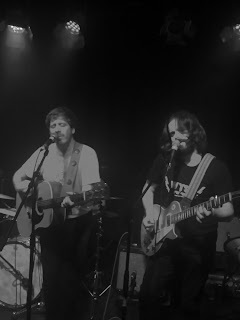 The main feature of the night was Treetop Flyers returning to Birmingham to promote their new album and it was initially unfortunate that this clashed with Laura Cortese and the Dance Cards playing the city on the same evening. However a touch of good fortune appeared when it was announced that Treetop Flyers would hit the Hare and Hounds stage at 9:45 and Laura’s first fifty minute set would end around 9:30. Hence a super gig evolved out of two venues barely twenty yards apart. First of all apologies to Laura and her musical companions for not returning to see their second set after the break. However enough was seen in the first half to give the four piece band, assembled from right across the North American continent, a hearty plug in this write up. Laura was no stranger to this part of Kings Heath having played the Hare and Hounds with Session Americana only last October. This time the set up was wholly different as she fronted a quartet of two fiddles, cello and a double bass. Laura was paired in the fiddle department with Jenna Moynihan, leaving cellist Valerie Thompson and Winnipeg native Natalie Bohrn on bass to complete the band. From such an acoustic base the sound unsurprisingly had a folk and roots feel to it, although a contemporary twist was woven into the music. 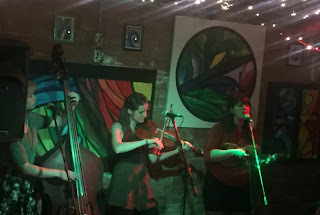 The set played to a responsive Kitchen Garden Café gathering was a mix of brand new material, traditional fiddle tunes and an opening instrument free song sprinkled with sparkling harmonies. 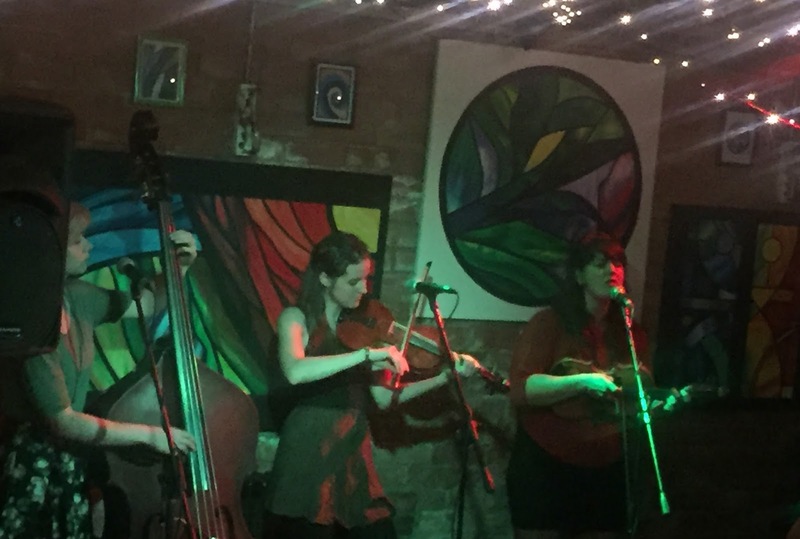 Whilst being far from your usual acoustic roots combo, Laura Cortese and the Dance Cards came across as a zestful group of talented performers joining a lengthy list of traditional musicians confident enough to take their accomplished brand of music far and wide. The trip from the London area to Birmingham was not exactly in the transatlantic realms for Reid Morrison and his merry bunch of Treetop Flyers. 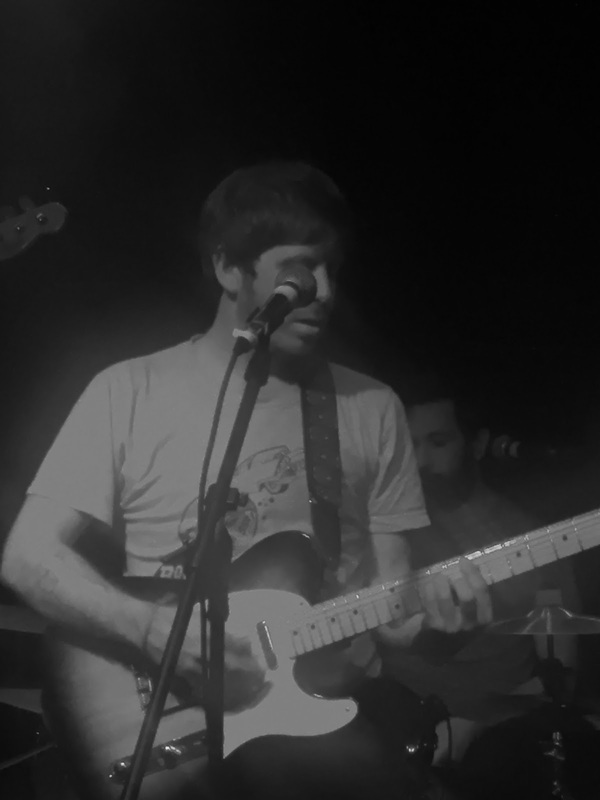 This five piece band on the Loose Music label have been racking up the exalted reviews for their brand new album PALAMINO and this headline show at the Hare and Hounds was the first extended chance for Midlands based fans to listen to most of the material live. The guys made a fleeting visit to the city last autumn to play a low key gig at the Sunflower Lounge and are due to return this September for a prestigious slot at the Moseley Folk Festival. This interim city gig was a headline scheduling preceded by three support artists, and perhaps one will never know how these acts would have matched up to Laura Cortese. One thing for certain is that Treetop Flyers were in blistering form as soon as they hit the stage and for an hour and a quarter they showed why they are being rated so highly on the live circuit. A few teething problems with the sound did surface during the set, although the band masked the bulk of these in their ability to craft an abundance of wonderful guitar and keyboard based tunes. Pinpointing the sound of Treetop Flyers is a tough task especially if you want to avoid West Coast Americana clichés. Similarly labelling them an indie/alt-country hybrid is being too simplistic, so just leave it that they are one hell of a finely tuned rock ‘n’ roll band, rich in a plethora of mind splitting extended musical interludes. Of course it helps to have a front person so passionately involved in each song and Reid Morrison is such an intense performer that he hypnotises you with a well-stocked pile of excellent Treetop Flyers songs. Having been sold on their live performance last time and ensuring PALOMINO has been on perpetual rotation since its release, tonight was the crowning interaction with the band, all witnessed from just a few paces away. Watching every ounce of emotion emanate from Reid’s face as he poured out ‘St. Andrew’s Day’ was inspirational. Likewise witnessing Sam Beer alternate between keys and lead guitar amidst contributing to loads of stunning tunes was worth the admission price ten-fold. The major candidate for set highlight was the scintillating ten-minute pre-encore version of ‘Dance Through the Night’. Although on ‘any given Sunday’, it could have been run close by ’31 Years’, ‘Sleepless Nights’, 'Wild Winds' and ‘You Darling You’. In truth you can pick any of the tracks from the new record and it has certainly been worth the wait since the previous release in 2013, and the band’s subsequent re-appraisal. There will be a gross injustice if Treetop Flyers aren’t the live breakout band of 2016. If this isn’t the case, they are totally sold on me and any waxed lyrical musing is entirely based on foundation. Hopefully their live presence will continue to grow and subsequently their time on stage. However this improvised evening of fifty minutes of Laura Cortese and the Dance Cards and seventy five minutes of Treetop Flyers was a triumph of innovative good fortune, proving that brilliant live music is not normally that far away if you seek it out.